Twitter ReTweet services are for ReTweeting your Tweets or your website using multiple unique accounts. This service works for both retweets of your tweets and on any website or blogs. More information about this service is given at the bottom of this page. Being the most important micblogging social network, Twitter is designed to spread messages to masses online. ReTweeting is basically repeating the very same message or link from an account. So what we are doing here is to take your message, link, website, etc, and repost it on many unique twitter accounts. Hence, retweeting will spread your message out, and it will dramatically increase its visibility. Retweeting has many advantages and especially it is becoming heavyly weighted by search engines which makes it a very important SEO tool too. It does actually create backlinks to your link or website from twitter which search engines appear to take more and more into consideration. 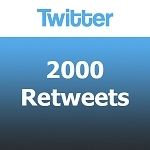 With our retweet service we can retweet, your tweet, message with any hashtags (#), link, website or blog. Again, we will not require any password or admin access to any of your accounts in order to provide this service. 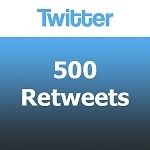 We will only require the link (URL) of your tweet or website. This information will be asked to you when choosing to add a service to your shopping cart.